August 27, 2013 — Last weekend, H.P. Lovecraft became a lot more Providence. Or, more accurately, Providence became a lot more H.P. Lovecraft. On the evening of August 22, at the Providence Athenaeum, in front of a crowd large enough to give a facial tic to a fire marshal, sculptor Bryan Moore and film maker Jovanka Vuckovic whipped off a black shroud to reveal the life-sized bronze bust of native horror author and international legend, Howard Phillips Lovecraft. The monument is the first of its kind. Just seconds after the unveiling. There are a lot of great stories behind that moment and that monument, and I got to talk to a lot of cool people who helped make it happen, but, honestly, I need to save most of that material for my current book project. Right, I know, it’s a book about Edgar Allan Poe not H.P. Lovecraft, but everything about that night and that memorial and that place are relevant to it. 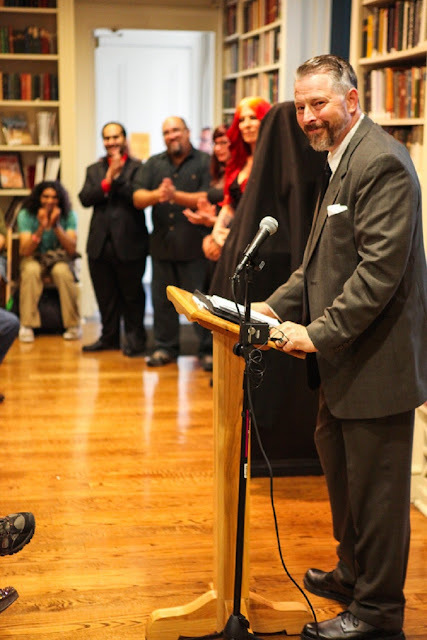 But they gave me excellent access to the event, so I thought I’d post a few words and pics about the night while Lovecraft is still getting used to his new digs at the Athenaeum. 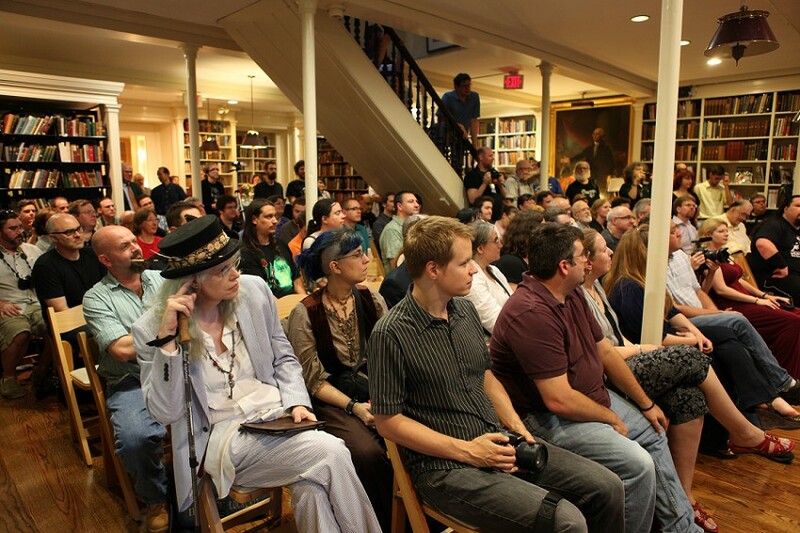 The event was one of the kickoff points of NecronomiCon, a convention dedicated to the Providence horror writer who bequeathed us his Cthulhu Mythos. So it was the perfect city and the perfect occasion to honor HPL. Oh, and it was the perfect place. The Providence Athenaeum is, well, awesome. 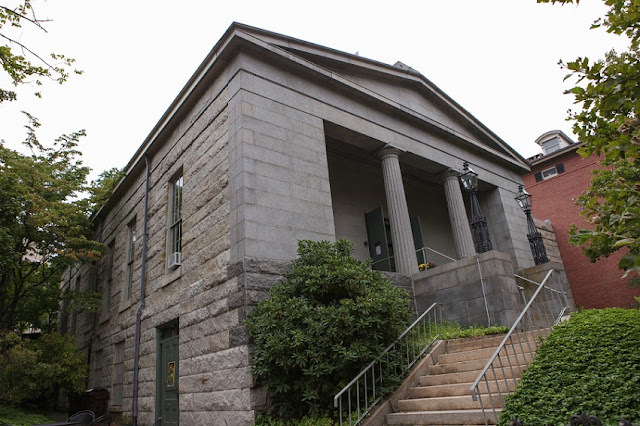 It was built in 1838 and famously visited by Edgar Allan Poe less than a decade later. He took a copy of his poem Ulalume from its shelves and autographed it to impress a lady friend. More than half a century later, Lovecraft skulked among those same shelves. And now he’s there forever. Lovecraft’s grave, two and a half miles away in Swan Point Cemetery, declares, “I am Providence,” but for decades, there was no real proof of that. In 1990, he got his first public memorial in the form of a plaque in front of the John Hay Library. Now, more than twenty years later, his physical legacy takes an elder-god-sized step forward. Before the unveiling, I talked a bit to S.T. 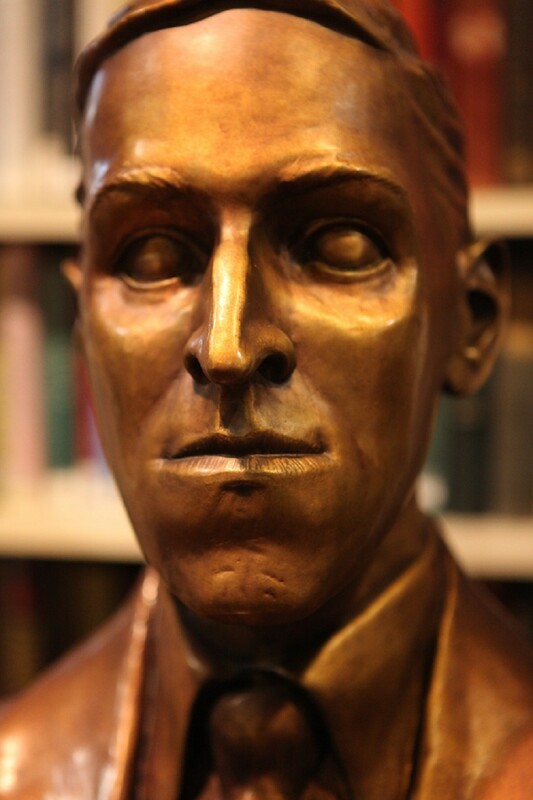 Joshi, the man who pretty much invented Lovecraft scholarship and who was instrumental in the Hay Library plaque. 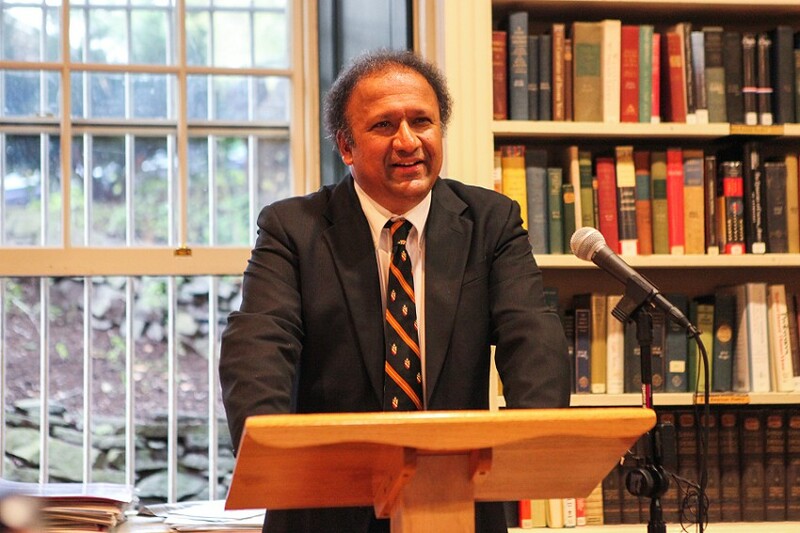 He was fresh from giving the keynote speech of the conference in the nearby First Baptist Church of America. He told me, “This is a huge part of the continued emergence of H.P. Lovecraft in his home city. He was a world figure, now he’s a Providence figure. It’s just going to keep going from here.” And in a sense it already had. In addition to the unveiling of the bust, the city had recently named the intersection of Angell and Prospect Streets, just a few blocks away, H.P. Lovecraft Square. Oh, Bryan knows he's done something extremely cool. To help get the funding he needed, he teamed with Jovanka Vuckovic, a film maker who rose to prominence in the horror community through her role as editor of Rue Morgue magazine. She was well-connected and had experience (and, more importantly, success) producing projects before. They used Kickstarter for the project, setting a goal of $30,000. It was funded within 48 hours, and, by the end of the whole run, they’d nearly doubled that goal. 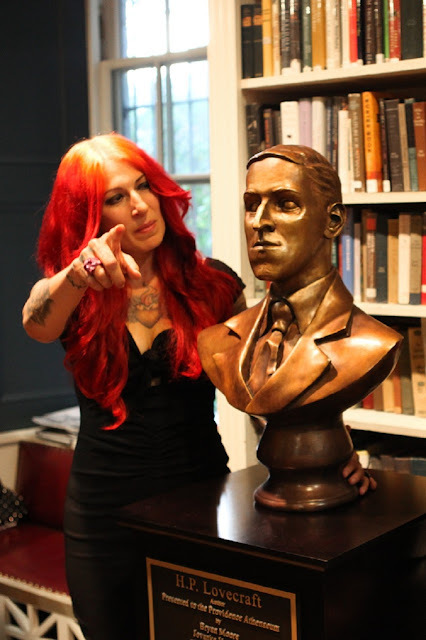 Jovanka tries to get Lovecraft to face my camera. 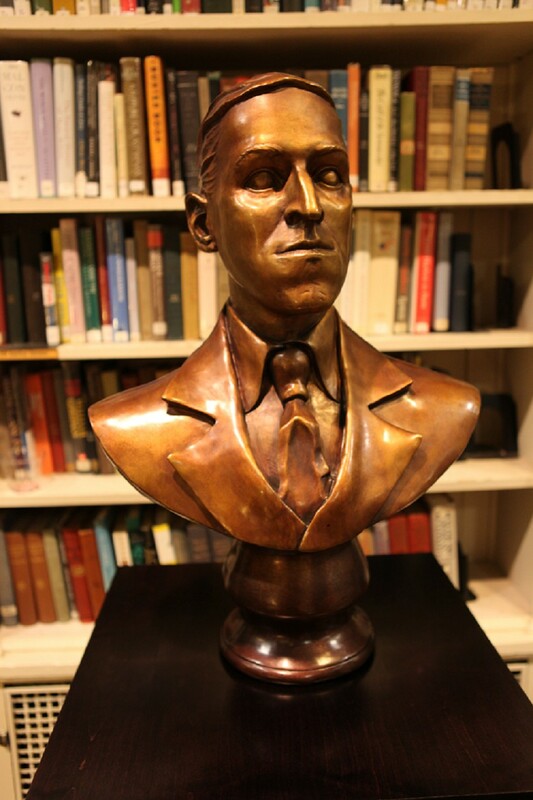 It seems the horror community was ready for a Lovecraft bust and that the right people were behind the project. The culmination of all that work was the unveiling ceremony. 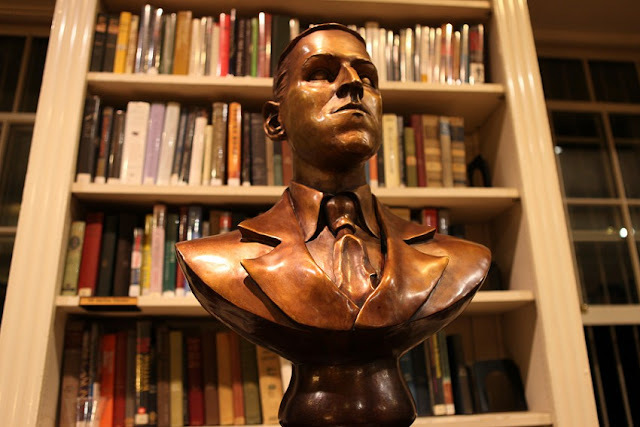 It was held in the bottom floor of the Athenaeum, in a room adjacent to a display of Lovecraft and Poe artifacts (including the aforementioned Ulalume autograph and Lovecraft’s own sketch of his signature creation Cthulhu). Because the space was small, they limited the attendance. Still, one estimate had about 160 people there. And this was before the audience had reached full capacity. 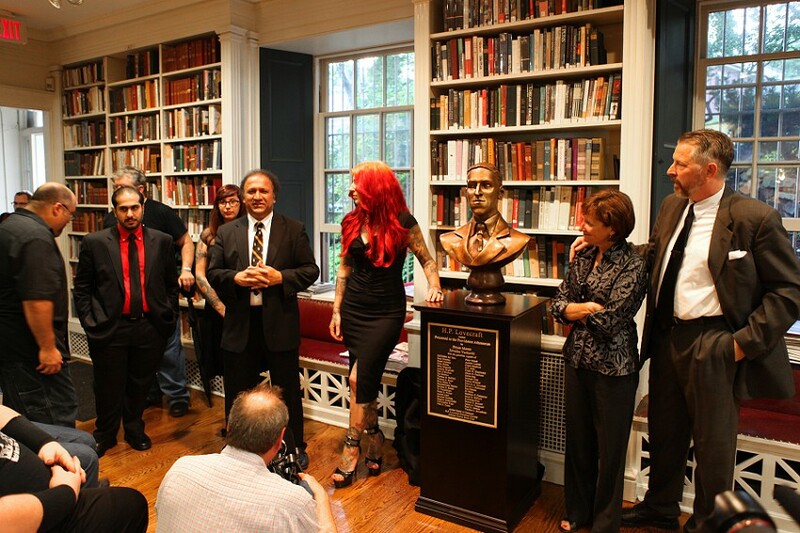 During the ceremony, the key people involved in the project stood at the front, flanking the bust. Bryan and Jovanka, of course. S.T. Joshi. Also Alison Maxwell, director of the library and the one was forward-looking enough to accept the bust when so many other locations turned it down. Also Sultan Saeed Al Darmaki from Abu Dhabi, who was a big supporter of the project; Frank H. Woodward, the director of the documentary Lovecraft: Fear of the Unknown; and Mallory O'Meara, who was part of Bryan’s core project team. Jovanka Vuckovic, H.P. 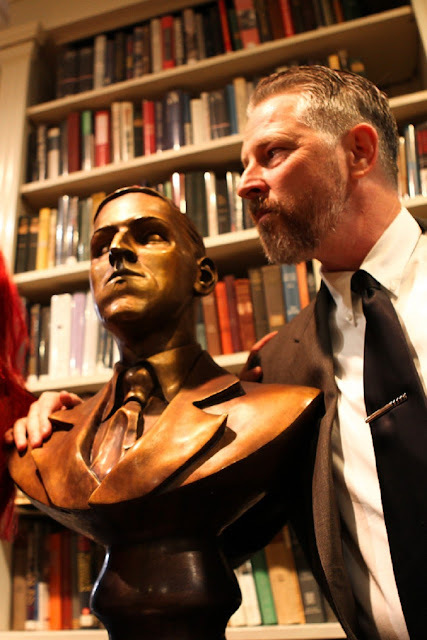 Lovecraft himself, Alison Maxwell, and Bryan Moore. 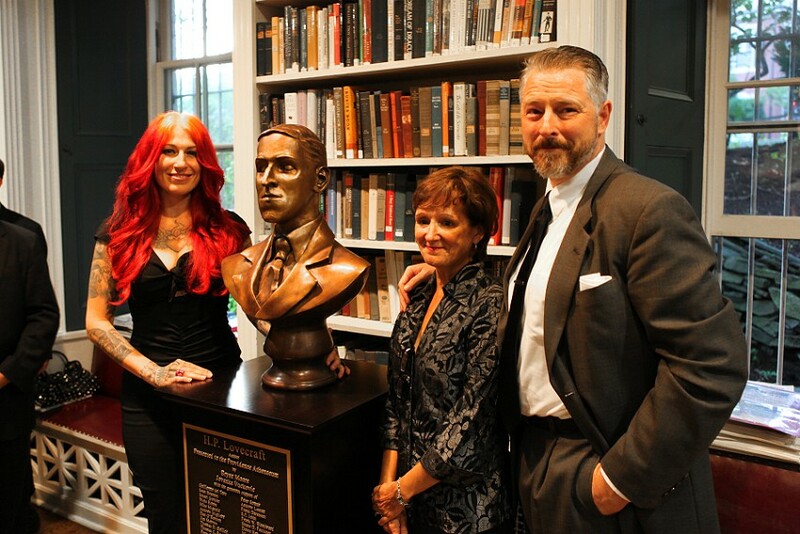 Beneath the bust, on a custom-made stand, was a bronze plaque listing other supporters, those who had given at least $500 to the Kickstarter project. The names ranged from big genre recognizables like Guillermo del Toro, Peter Straub, Frank Darabont, Mike Mignola, and Stuart Gordon all the way to fans who just wanted to have a tangible part of Lovecraft’s legacy, some of whom had flown across the continent just for the unveiling. After a few speeches and the inauguration of the bust itself, poet Brett Rutherford introduced a performance of a selection from his play Night Gaunts, based on the life of HPL. The rest of the night was pretty much a swirl of wine for me, but I always found myself, like everybody else that night, back at the bust, marveling at the unmistakeable long face of Lovecraft and Bryan’s own craftsmanship. 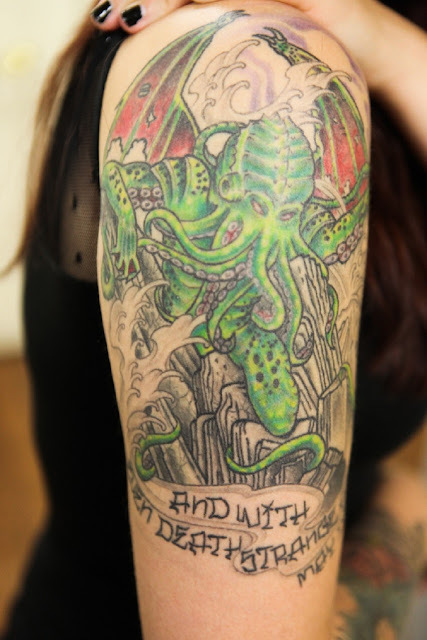 As will so many Lovecraft’s fans going forward. The most compelling bit of context for me, though, was when I was exiting the building after the evening was over. To do so, I had to go up the stairs and into the main library room. Two stories above, set on pedestals around the ceiling were the plaster busts of Greek gods, foundational philosophers, world leaders, and some of literature’s greatest writers. That’s the party Lovecraft is now crashing, with his visions of old gods and insignificant lives, of a terrifying, numbing universe…the one that so many of us love. And now we can go to Providence, look him right in the eyes, and tell him so. 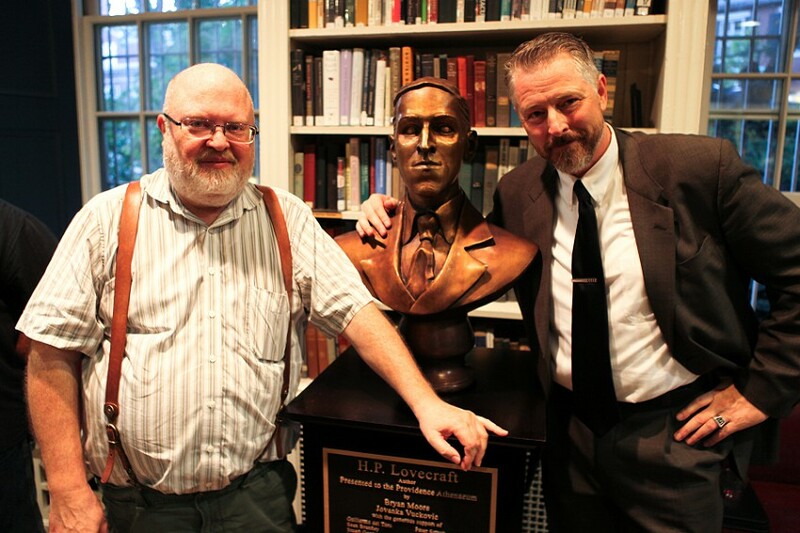 Bryan and Lovey with Sandy Petersen, creator of the role-playing game Call of Cthulhu. He has his own Wikipedia page. Dig this kind of stuff? 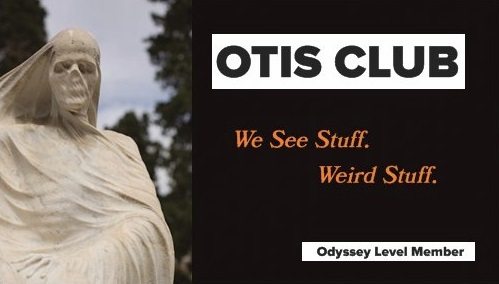 Follow OTIS on Twitter and Facebook. Or check out my books, The New England Grimpendium and The New York Grimpendium.